1) What is the balance between Hillwalking vs Technical Climbing in STMC ? Most members are hillwalkers rather than technical climbers. All meets provide opportunities for hillwalking. In some areas, notably North Wales, the Lakes and the Peak District there will sometimes be a party doing some scrambling or climbing. But if you're not interested in climbing don't worry, climbing-only meets are a rarity and there will virtually always be people on the meet to walk with. 2) How does a club in London do hillwalking ? We arrange weekend 'meets', normally every two or three weeks, in areas with hillwalking interest. The areas most frequently visited are North Wales and the Lake District, but we also visit a wide range of other areas, including South and Mid Wales, the Welsh Borders, the Southwest (Dartmoor, Exmoor, Dorset), the Peak District, Yorkshire. We also arrange week-long trips to the Scottish Highlands in February and May of each year. 3) Are there any social events ? We normally meet in London at 20.00 on the second Tuesday of each month. See Socials for details. The pub meet is a good opportunity for potential members to meet members of the club and find out more about the club. In December we have a Christmas meal at a restaurant in London which is a very popular event. 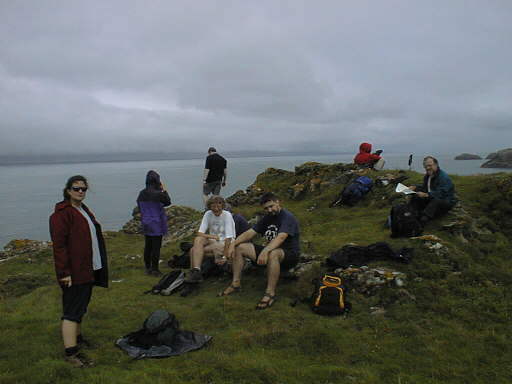 Other social events are occasionally organised on an ad hoc basis - for example local Sunday walks with a pub lunch. These walks are great for non-members to spend a day socialising with us. 4) What is the typical age group of the club members ? There is no typical age group for the club. Member's ages vary from around 30 to about 70. We have a good mix of different age groups. It has to be stressed that for hill walking and mountaineering, age is not so much an important factor. We are all a friendly bunch and no matter how young or how old you are, you will feel right at home. 1) What is the current membership fee ? 2) How do I join ? Complete the membership application form and send it to the Membership Secretary together with your subscription of £25. The membership secretary will send you a membership card and you will then start to receive our E-News. And you're in. It cannot be any more simpler ! 3) What do I get for £25 membership fee? The money goes on running the Club - ie the cost arranging meets and socials, hosting the website, etc. You need to provide a current e-mail address so that you can receive the Club E-News e-mail which is issued about once every two months. The Club has an account with one of the major chains of outdoor shops which allows members to purchase gear with at least a 15% discount to the published price. 4) I live outside London, can I still join ? Although we are 'London-based', many of our members live in Southeast England outside the M25. In fact this can be a distinct advantage when it comes to getting away onto a meet on Friday afternoon. But if you live outside the Southeast you will probably find there are other Clubs closer to home. 5) What about costs for going on meets ? The membership fee does not include individual meet costs. The costs for each meet you attend will need to be borne by yourself. Typically the expenses involved in a meet include travel, food and accomodation costs. Meet secretaries strive hard to arrange travel in as much less vehicles as possible. This will not only help keep costs as low as possible but is also environment friendly. 6) Can members attend all meets ? Yes, you can attend as many meets as you wish (provided they are not full). The only meet where we impose a restriction on attendance is the Scotland Winter Week, where it would normally be dangerous to go out on the hills unless you are equipped with ice axe and crampons, and have some experience in their use. The winter meets in North Wales and the Lakes sometimes, but by no means always, coincide with serious snow and ice conditions, but there are usually lower routes that you can do if you don't have ice axe and crampons. 7) Can non-members attend meets ? Unfortunately not. Members are covered by the third-party liability insurance as a result of our affiliation to the BMC. Non-members on meets would not have this cover. If you want to have some contact with the club before deciding whether to join, you are welcome to come to one of our London Social evenings on the second Tuesday of each month except December (See the Socials page on this website). 8) How can I get more information ?
. If you would like to meet a few members you are welcome to come to one of our London Social evenings at the Perseverance(See the Socials page on this website). If you want to get more of a feel for what happens on the meets, why not read one or two of the Meet Reports. 1) What equipment would I be expected to bring? For prospective members who have no experience of hill walking we provide an equipment list as, although hillwalking need not be an expensive hobby you do need to make sure you can stay warm and dry - usually this just means warm clothing, decent waterproofs and boots, plus food and drink. See the Equipment page on this website. The only other requirement is that we do expect everyone to have appropriate maps, so that no-one is just totally depending on someone else to do the route finding and map reading. 2) Are maps and compass mandatory? In a typical meet you might find one or two members come with suggestions for routes and then do most of the map-reading for the group. So you might come away from a meet having never used your map. However, in the unlikely event of a member getting lost or detached from a group, a map and a compass would be necessary to get back to start on your own. 1) How much experience and fitness do I need ? The Club has traditionally covered a wide range of abilities. Some years a few of the fittest members may attempt the Welsh 3000's (fifteen 3000ft peaks in one day), but there are plenty of members who find just one of these peaks a good day's outing. Obviously a certain minimum level of fitness is necessary, but if you can manage 12 miles comfortably you should have no problems. The more experienced members are always willing to give whatever help and information they can. However it must be understood that STMC does not provide leadership or professional guiding or instruction. 2) I am relatively new to ropes and climbing. Should I be worried? Don't be. Almost all of our meets involve mostly hill walking. You might find a group or two tackle a difficult grade scramble or a climb. In such cases you will find that there will be other groups less ambitious who might be doing a low level walk involving some picturesque routes. 3) What if I am interested in a low level walk only? Since several small groups tend to get formed in one particular meet, there is always something for every body. So there is always a possibility you might find like minded members wishing a smaller low level and less taxing walk on that day. 4) How long do we walk every day ? Depending on the terrain and weather conditions we walk around 8 hours in a day. A typical day would start at 9 am in the morning and you can expect to be back in the hut by 5 pm. The distance covered in a normal walk could vary from 12 - 18 miles. 1) How is travel organised to the meets? Travel is arranged in members' cars, sharing car costs. We travel to the meets after work on Friday evening, returning Sunday evening. So, if you do not have a car, the Meet Secretary will arrange a lift for you in a member's car. If you have a car, you will probably be provided with one or two passengers; or you may have the chance to leave your car at home and go with some-one else. 1) How do I book onto a meet ? Once you are a member, you are given an extensive meets list for the forthcoming meets. This includes details of the meet secretary organising the meet. You can either email or call the secretary and indicate your interest. Provided there are places available, you are booked ! 2) What sort of weather can I expect ? Depends on when you are going on a meet. Summer months are usually pleasant and winter meets could be cold and ice conditions. We do experience the odd british showers now and then. 3) Where will I be staying for a meet ? Accommodation is usually arranged in a remote bunkhouse or a hut. Do not be surprised if a hut is in the middle of nowhere. Such locations are carefully chosen so that it is easy to start a walk without having to travel too far. The only exception to this are the Scotland meets where the accommodation is arranged in a self catering chalet. In the summer months, we do have camping meets where the accommodation is a campsite. 4) What is the quality of the overnight accommodation like? Exactly the same as you would expect in a remote mountainside hut - basic and authentic. 5) What food and drink do I need to bring ? For the hill, lunch plus some spare food, plus a water bottle or something to drink (or maybe a thermos). You also need to bring breakfasts. On Saturday evening some members usually eat in the nearest pub. If you prefer to make your own arrangements, most huts have basic cooking facilities plus pots and pans, and some members often bring their own food and 'eat in'. Please note that STMC will not continue to be affiliated to the BMC after end 2013.